Organize and store your kitchen supplies all in one easy to manage place with this 9-compartment condiment caddy. Featuring 3 tall, 2 rectangular and 4 square compartments, you can easily store coffee and tea supplies, spices, condiments and so much more on your kitchen countertop or in an office setting. 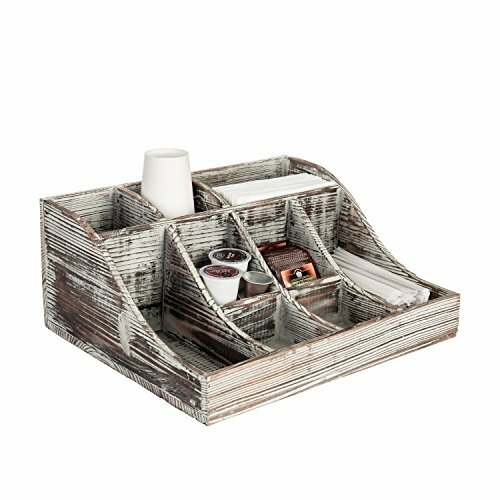 A rustic wooden construct and torched wood finish allow you to easily incorporate this organizer into any space. With its multi-purpose use you'd could even use it to store makeup, cosmetics, nail polish, tools, or arts and crafts items. **Official MyGift® product** Condiments and accessories not included. Approximate Dimensions (in inches): 6.5 H X 15.5 W X 12.75 D.
Features 11 various sized compartments for tea, cups, creamers, sugars, napkins or straws.